Frederick Robert Buckley aka F.R. 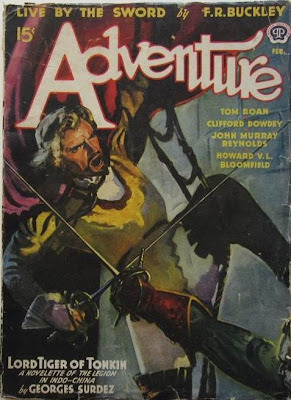 Buckley (1896-1976), is probably best known for his series of stories in Adventure, about Luigi Caradosso, an Italian soldier of fortune in the middle ages. The Caradosso stories are told, tongue firmly in cheek, in the form of letters from a man in his retirement, offering advice to his master’s successor. Buckley was also the author of the Peg-Leg Garfield series about a one-legged sheriff who muddled his way through life and crimes, and a writer of western stories as well. As for your being my son, according to your letter of iiij days before the Feast of the Blessed Innocents, I should doubt it; not having been at Siena (to the best of my present memory) since the year of our Lord God 1528; and then in jail, and the jailer had no daughters. I may be wrong; at seventy-eight a man can not remember every night’s lodging; I will ask Bertuccio Bucca, who was my lieutenant in 1537, and by good hap cometh to visit me in a few days. Yea or nay, however – and with regret, because both of thy destitute condition and of my own damnable state of rheumatism – I must refuse thine offer to come here and be physician to my senility. In fifty years as guard captain and such-like to the best families, I have not seen it to be well that old men should live with relatives skilled in the use of drugs. Frederick Robert Buckley was born on 20 December, 1896 in Colton, Staffordshire, England. He was the son of Robert John Buckley and Mary (Wakelin) Buckley. His father was a newspaperman in England who went on to be the music critic for the Manchester Guardian. He spent his childhood in his grandfather’s place, going to King Edward the Sixth School and then to Birmingham University for a course in journalism. After the course, he worked in newspapers in England and France. In 1915, he immigrated to the United States. He became a movie reviewer and then assistant editor. He also became a secretary to a munitions magnate at the time and held a job as a foreman of a building materials yard for some time. His next position was editor of the Motion Picture Mail (a Saturday magazine supplement of The Evening Mail, a New York City newspaper), from which he moved into the motion picture field, writing scenarios and reviewing scripts for the Vitagraph Corporation, a leading studio at the time and a producer of many famous silent movies. He even acted in a few movies, but failed to make a hit, and decided to become a full time writer. This must have been the time he also met and became friends with Tom Curry, another author, whose father was private secretary to the leading broadway producer David Belasco from 1914 to 1931. In 1916, he married Helen Curry, Tom’s sister. By 1920, they had moved to Norwalk, Connecticut. In 1921, Buckley had his first success with the Peg Leg Garfield series of stories in Western Story Magazine. In 1922, he won a O’Henry prize for his short story, Gold Mounted Guns, in Red Book magazine. That was also the year his daughter, Faith Ann, was born. At one time, he was highly interested in the west, and to gather background material for his stories, he lived in Laredo, Texas. 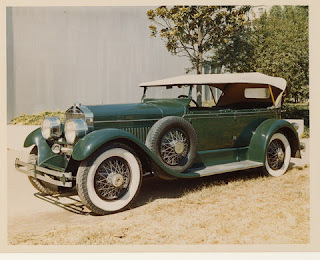 He collected guns, and owned a large red Cunningham touring car. In order to get atmosphere for his western stories, he used to wear ranch clothes, including a holstered gun. This habit continued even when he returned to Norwalk, Conn. In 1923, he became a citizen of the United States of America. In 1924, he started the Caradosso series in Adventure, which was to make him one of the most popular authors. The Caradosso stories were not reprinted or collected, but are his best work, in my opinion. He continued this series through the 1930s and 1940s, and the final story (I think it was a reprint), was published in 1953. In 1931, his wife committed suicide. And that’s all I could find out about him till his death, which according to the social security death index, happened on April 12, 1974. Or perhaps not. There are conflicting dates from different source, and perhaps a reader of this blog with library access in the area can find an obituary and share more details. He seems to have returned to England in 1932 and according to the FreeBMD site, he passed away in June 1976. I always enjoy your Blog. You have most interesting posts to read. It's a delight to keep up with each new message. I'm curious about how you got your background on the Blog, though. I also have several Blogspot Blogs, but have not figured out how to add anything to the sides like this. I love the images of pulp covers like you have with this one. Any help is appreciated. Hi Tom, thanks for the compliments. Good to hear from someone who's reading the blog. What i did to get the background was this. I created a tall, rectangular, two column picture by copy pasting all the cover images into one canvas in Paint (I use Windows). (I had to resize each picture to the same size first). Then i saved it as a black and white picture and reduced the size to around 300 KB. (Save the original as well separately in case you need to go back and make some edits). Then I went to my Blog Dashboard and followed the steps in this video to set the image i had created as my blog's background. Yes, thanks. I didn't know I had that option. I will have to watch it a few times to understand it, however (lol). Thanks for your help on this. Appreciate it! I find the reading, collecting, and history of magazines to be endlessly fascinating. Not only the pulps but the digests, slicks, and literary magazines also. Pulpflakes will soon be hitting the 10,000 visitor mark and maybe we should celebrate the occasion with a party. This is one of my favorite blogs. Walker, thanks for the compliments and a great idea. At this time, I can only host an online party, and i'm hoping y'all will come. What do you think of a Camp-Fire kind of article where readers of this blog can talk about what started them reading and anything else they want to talk about. I'll get that kicked off soon. We can have a party in real life if and when I manage to be in the US at the same time as a major pulp convention. I love the Camp Fire column in ADVENTURE and have spent many hours reading letters from old timers that fought Indians and lived in the old west and the tropics. Hope that you can visit us sometime during Windy City or Pulpfest.